Is it time to upgrade your water heater, or has a catastrophic failure forced you to look for a new water heating unit? NCWaterHeaters carries a variety of updated, traditional tank-based water heaters from manufacturers like Rheem, Navian, G.E., Rinnai, A.O. Smith and more. NCWaterHeaters provides repair, upgrade and replacement of old or failing water heaters in homes and businesses. Replacing your water heater will most likely improve the efficiency of how you generate hot water for your home or business. You may have a natural-gas based water heater, or one that runs off of an electrical connection. Our professional technicians can help you pick the replacement to match your current water heater, or discuss the advantages of switching location, size, or type of water heater. We will come to your home or place of business, analyze the current situation, identify the best location for the new system, and make recommendations to you based on price, efficiency and your home or business demands. Make sure to discuss our one year labor warranty on all water heaters we install and ask about how we can save you $100 on a new tanked unit or $200 on new tankless water heaters. Some models are eligible for utility company rebates and incentives. NCWaterHeaters is a certified Duke Energy HEIP contractor. 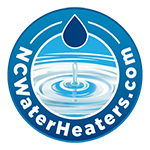 We provide expert services throughout the greater Triangle-area, including Raleigh, Chapel Hill, Cary, Apex, Holly Springs, Wake, Durham, Harnett and Johnston counties and surrounding areas through this website, NCWaterHeaters.com.